Easy Way to Convert Video/Audio in Mono, Stereo/2 channel to 5.1/6 Channel, Convert Mono, 6/5.1 Channel to 2 Channel/Stereo, Convert 6/5.1/2/Stereo to Mono! Convert 5.1 to 2 channel stereo like convert H.264 MP4 5.1 audio to 2-channel stereo source so as to play MP4 with 5.1-channel on Xbox 360. Convert 6 channel to 2 channels like convert 6 channel AC3 to 2 channel MP2 or convert an MKV 6 channel audio to 2 channel stereo without affecting video quality. Convert 2 channel audio into 6 channel to get surround sound in order to listen surround sound from home theater. Convert multiple-channel to mono like 5.1/6 channel to mono, 2 channel stereo to mono and etc. The following will take convert 2 channel to 5.1 channel as an example. 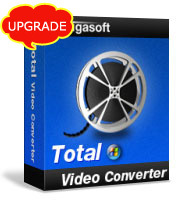 Free download the powerful Audio Channel Converter - Bigasoft Total Video Converter (for Windows, for Mac), install and fire up, the following interface will pop up. 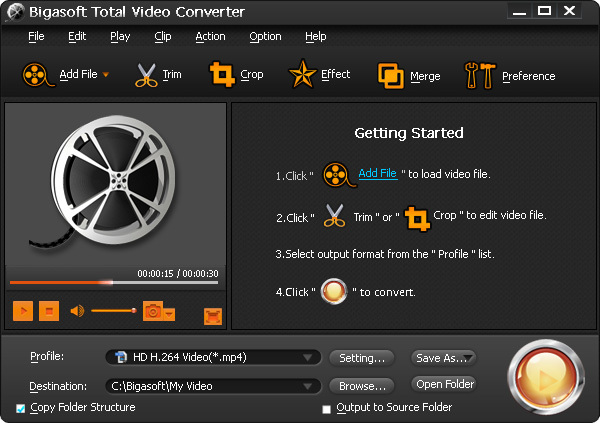 Acting as the professional Audio Channel conversion software, Bigasoft Total Video Converter can easily change all kinds of video audio channels to 5.1 channel, 2 channel stereo or 1 channel mono. It even can convert audio channels between 6/5.1Channel, 2 Channel/Stereo and Mono. 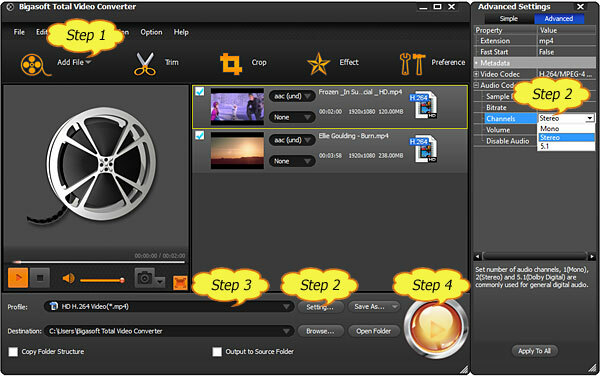 And it supports to change audio channels in various video or audio formats including MP4, H.264, MKV, AVI, WMV, 3GP, MOV, RMVB, WebM, WTV, TRP, MXF, MVI, AVCHD, DV, VOB, DVR, MPEG, FLAC, DTS, OGG, CAF, AC3, AAC, WAV, WMA, RA, MP3, MP2 and etc. It has both Windows and Mac version to help you convert audio channel on PC or Mac OS X.
Click "Convert" button to start and finish the stereo to 5.1 channel conversion.